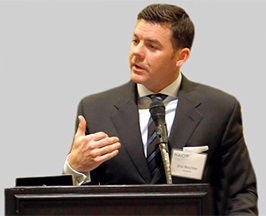 Mohr Partners, a global corporate real estate advisor, announces that Eric Beichler, Managing Principal in Mohr’s Dallas office, was a featured speaker at the NAIOP Tulsa chapter breakfast on February 25 at the Marriott Tulsa Hotel Southern Hills. Mr. Beichler made recommendations regarding building additional space and enhancing economic incentive packages to attract new development in the Tulsa market. He highlighted Tulsa’s close proximity to Dallas-Fort Worth, along with pricing and lifestyle advantages that could entice chief financial officers and other C-suite executives in making real estate decisions. Mr. Beichler joined Mohr Partners over 22 years ago and was promoted to Managing Partner in 1998. As an Equity Partner, Principal and Executive of the firm, he has been instrumental in many areas of the company as it has experienced substantial growth through recruiting, client sourcing and retention. Mr. Beichler was recognized as Mohr Partners’ Broker of the Year in 1997 and 2002, and Partner of the Year in 2005.